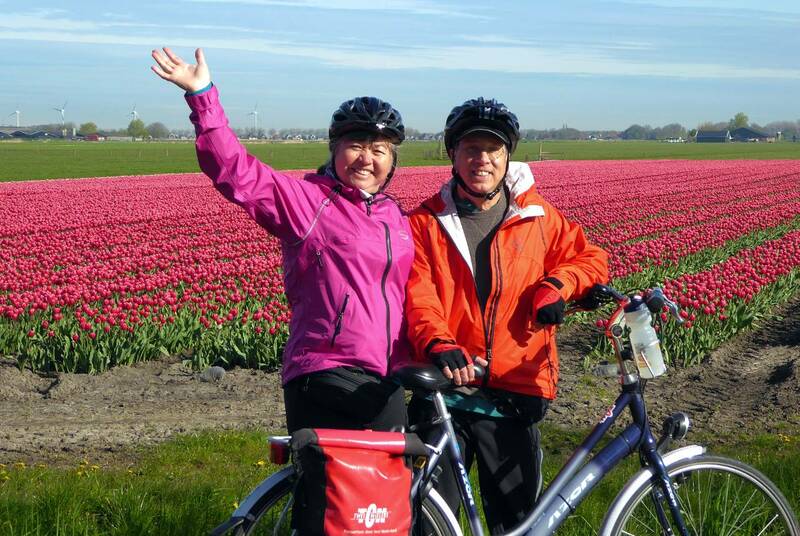 Bike and Barge North Holland-Tulip Cycling, Windmills, Texel Island, Alkmaar Cheese Market and More! Bike and Barge Kingsday Blooming North Holland! $1,499 - includes Keukenhof ticket upon request! BOOKING NOW for 2020! Our favorite Spring tour! Did you know that North Holland has the largest acreage of flower fields in the Netherlands? Come explore the open-air museum of the Zuiderzee, working windmills, Tulip Festival of Bloemendagen, a medieval castle and rich foliage of the Island Texel. We experience the national holiday of Kingsday, cycle to the glorious city of Alkmaar to visit their famous Cheese Market and enjoy tasty Dutch treats like Pannekoeken. 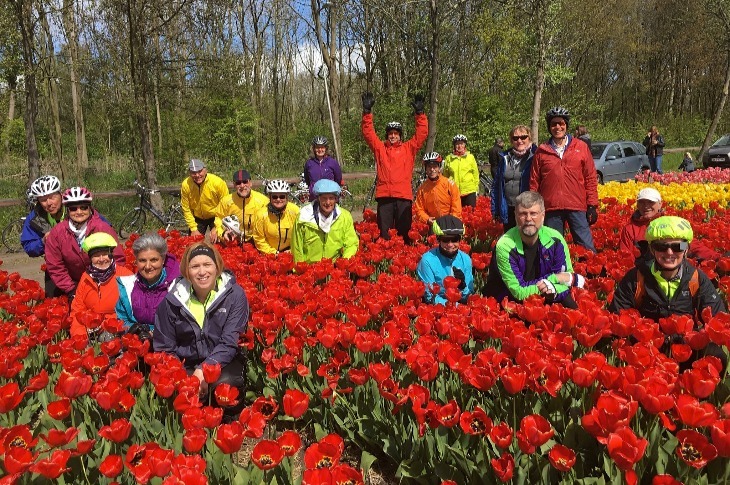 The best spring tour of Holland! 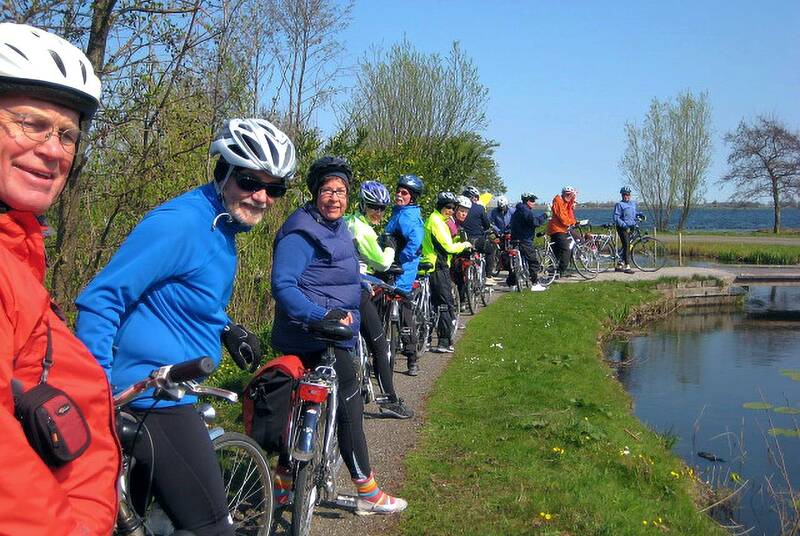 Our cycling today is a loop to the beautiful Waterland region. 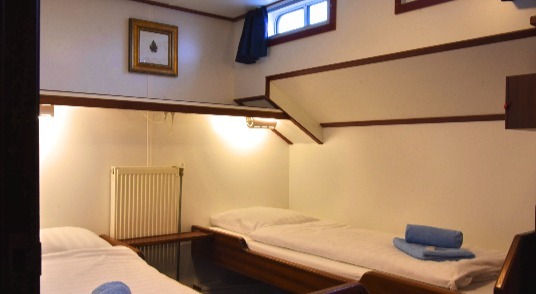 Weâ€™ll enjoy views of the vast Ijsselmeer (former sea) along the dikes and ride through lush polderlands, old farmsteads, and quaint fishing towns. In the village of Katwoude we visit a cheese farm and Dutch shoemaker. We return to Amsterdam and enjoy a wonderful dinner! Our ship sails early to drop us at the town of Volendam. 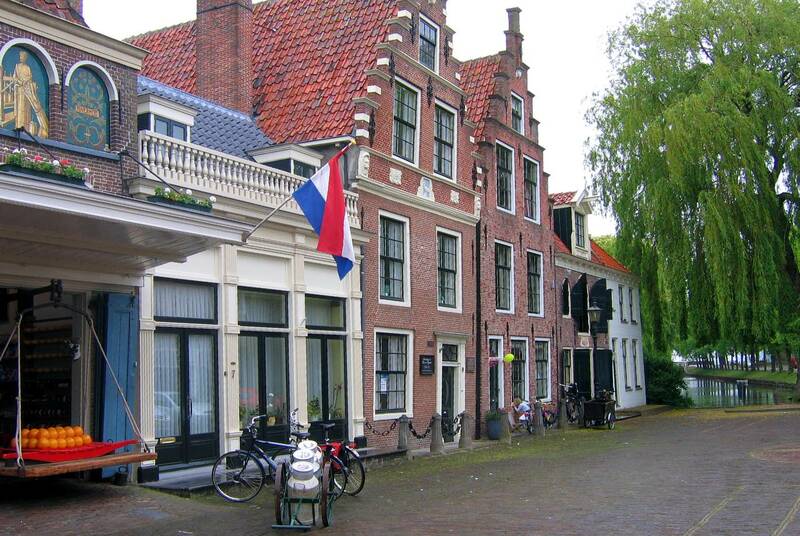 It's just a short ride along the beautiful Ijselmeer dijk to the quaint town of Edam, named after the famous cheese. We leave the water and pedal inland to enjoy the vastness of the Beemster Polder, an area drained between 1608 and 1612 for agricultural use. Coming eastward once more we enter the town of Hoorn, on the banks of the Ijsselmeer. We'll take time to explore this typical Zuidersee town which now has a thriving marina and ornate period buildings from the Golden Age of East Indies trading. After dinner we enjoy a stroll with local guide, Lidia Tacx. Today is the most famous holiday of the Netherlands: Kingsday, celebrating the birthday of King Willlem Alexander. There is decoration and festivities everywhere as the Dutch love their king and an opportunity to party! We'll head first to Enkhuizen with its finely decorated Renaissance buildings and the 17th century houses and warehouses of the former Dutch East India Company. Here we enjoy the open-air Zuiderzee Museum. We will witness life as it was over a hundred years ago as we take a guided stroll through an authentic fishing village. From Enkhuizen we travel along the coast to Medemblik, explore the famous Castle Radboud and join in for Kingsday festivities. We relax today as we follow the coast of the Wadden Sea and partake of the Bloemendagen (Blooming Days) Festival of the Anna Paulowna polder. On our way we stop at the Onderneming windmill in Hipolytueshof for a personal tour! Our destination is Den Helder, a bustling town famous for its residence of the Dutch Royal Navy. 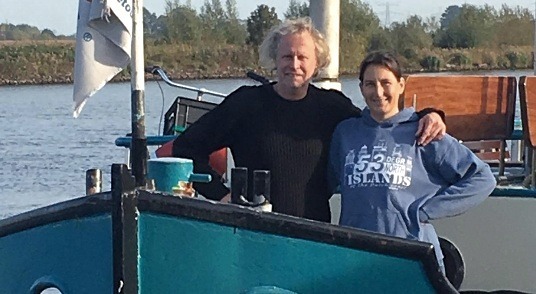 We visit the fascinating Marine Museum next to our boat docking. After breakfast we take the morning ferry to Texel. It will take a full day to totally explore this unique island with its beaches, picturesque fishing villages and nature preserves. Suzie and Roger hope to share some of their favorite secluded bike paths. 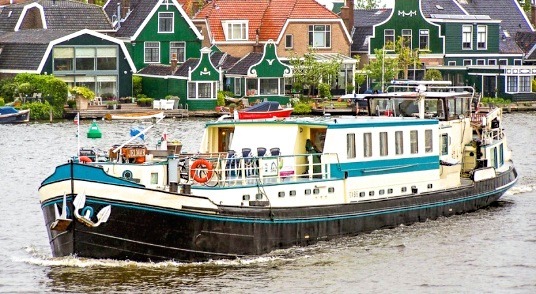 We'll return to Den Helder on the late evening ferry and savor a hearty dinner onboard our barge. Today, we ride the dunes of North Holland along the North Sea. 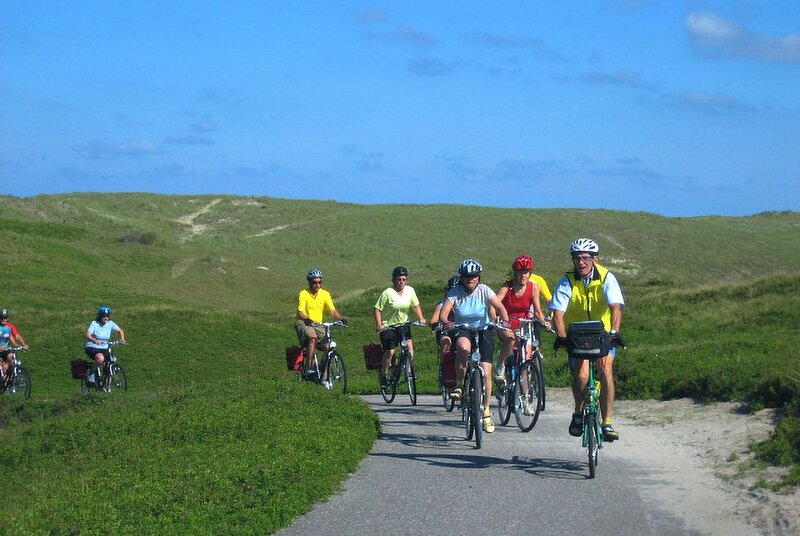 We will enjoy miles of gently rolling terrain along paved paths, following sandy landscapes overseeing views of vast polder areas of summer crops and flowers. As we turn inland, we'll partake of beautiful old farmsteads and stop by a bakery in Scharwoude village, where we find the oldest floating vegetable market. A short hop from here, we'll stop to photo three of the oldest windmills in Holland before heading Alkmaar, the biggest town in North Holland known for its beautiful historic center. After breakfast, we'll head into Alkmaar to see its popular cheese market. This exciting tradition with porters wearing white dress and straw hats is not to be missed. Our next stop is the lovely village of De Rijp for a Pannekoeken (Dutch pancake) lunch treat from Suzie. 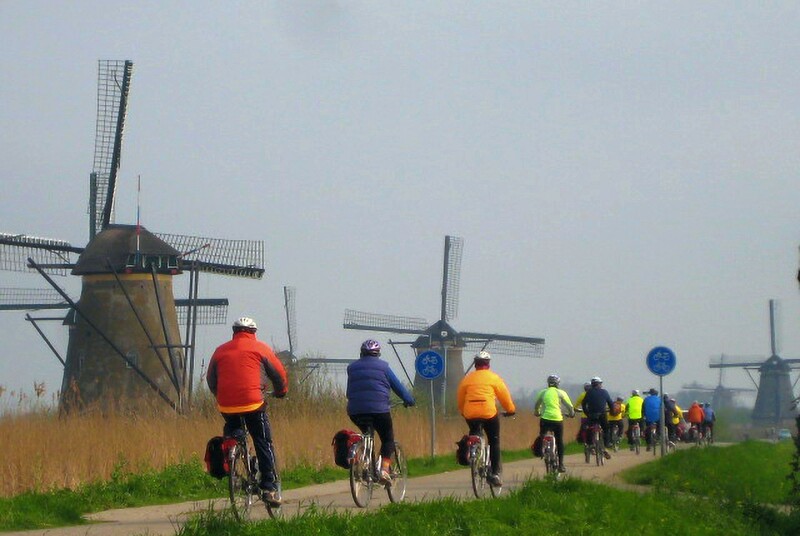 Weâ€™ll follow beautiful countryside into the museum village Zaanse Schanse - a delightful old hamlet with characteristic green wooden houses, charming gardens, tradesmen's workshops, and historic windmills. 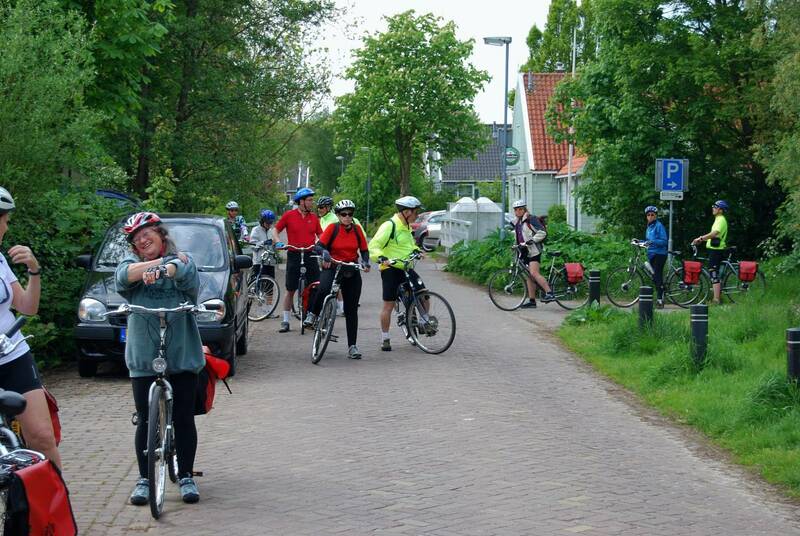 We cycle winding bike paths in the lovely nature area of Het Twisk leading to the short ferry into Amsterdam. Tonight we celebrate a special captain's farewell dinner! 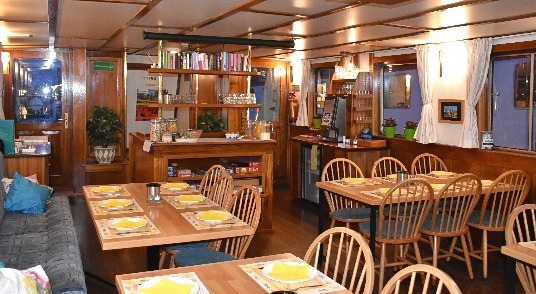 Saturday morning we breakfast, say our goodbyes and disembark at 9 a.m.
E-mail Suzie to inquire about openings and with any questions about this tour. We love to hear from you!